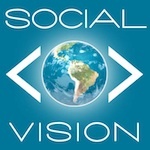 Social Vision Marketing / Foursquare / Happy Foursquare Day! It’s 4/16! It’s also known around the world as Foursquare Day! If you’re not in the social media game, you may not know about this important holiday and that Foursquare Day is celebrated around the globe on April 16th. Why April 16th? Because the number four squared is sixteen, so it only makes sense to have it today. If you feel out of the loop, don’t worry. 2010 was the world’s first official Foursquare Day. At that time, the location based social networking site only had about 1 million members. This year, they are closing in on 8.5 million members and growing steadily. If you don’t have a Foursquare account, I highly recommend that you check it out. It was around long before Facebook added the ability to “check-in” through Facebook Places. It’s also an awesome opportunity for businesses to connect with patrons, reward them for visiting and offer check-in discounts to keep them coming back. So, tell us, how did you celebrate Foursquare Day?